Each of the Pinemark Townhomes for sale is a three-bedroom, large home on a small footprint, and they have more storage and utility space with a garden-level basement and one-car garage. There is the family friendly section of the Warrior’s Mark neighborhood and not far from downtown Breckenridge. Pinemark is a little island of triplexes, tucked under the rising hill that leads to Warriors Mark West. They’re just on the outside of the loop that Broken Lance makes around the neighborhood open space that lies along the Blue River. Keep reading about the amenities around the community, or discover active Pinemark townhouse listings below. Pinemark Townhomes are staggered triplexes, so that each has its share of windows and incoming sunlight. They have a garage on the common drive and parking area, and are split-level inside. Living areas are on the main floor facing the forest in the backyard. 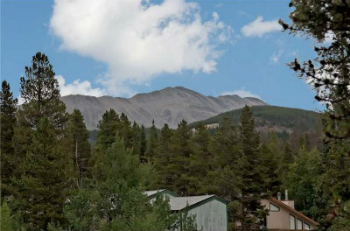 Trails to the national forest are easy to reach from the social, neighborhood trails in Warriors Mark, and downtown Breckenridge is a short walk down Broken Lance past the neighborhood greenspace and through the Columbine loop that separates Main Street Station and Warriors Mark. The Blue River, on which the neighborhood has fishing rights, is just a short walk away as is the greenspace. 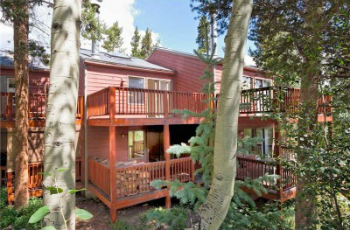 These town homes are on the free shuttle bus route so access to skiing either Peak 8 or 9 is just a short ride away. Amenities: in quiet part of Warriors Mark, on bus route, backing forest. 0866 to 0920 Broken LanceTake a right turn at the southern-most stoplight in Breckenridge onto Broken Lance Dr. Turn left at the first stop sign to stay on Broken Lance Drive and continue for about 1 mile until Broken Lance forks with White Cloud Dri. Turn right at this stop sign, and the entrance Pinemark Townhomes is immediately on the left. 0866 to 0920 Broken Lance. Are you ready to get started on your home ownership journey? You can contact us in two ways: by sending us a message online, or by calling us at (970) 453-2200.